Haley Moss, 15, loves art and has exhibited paintings in South Florida. (CNN) -- Figuring out what's cool. Struggling for acceptance. Dealing with homework. These are familiar perils of middle school. But Haley Moss did it all while dealing with a hidden challenge: autism. Now Haley, 15, is using her experience as a person with autism to help others deal with middle school. She wrote and illustrated "Middle School: The Stuff Nobody Tells You About," which details her advice for students. Autism is a developmental disorder that impedes communication and social interactions, and it often includes repetitive behaviors. Diagnosed in childhood, the condition prevents some people from ever learning how to talk. As many as 1 in every 110 children in the United States has an autism spectrum disorder, according to the Centers for Disease Control and Prevention. Haley's case is on the high-functioning side of the autism spectrum. She has always attended regular schools, doesn't have special classes and is a straight-A student at a prestigious private school in South Florida. "Most people just notice that I'm shy, and that I don't eat a ton of food at school," said Haley, of Parkland, Florida. "Other than that, I come across pretty normal." Haley has had a long history of working on that shyness. When she received her diagnosis of autism at 3, she couldn't talk yet. She didn't start speaking until 4. Her parents got her private speech therapy as well as hippotherapy, a technique that involves a horse and a speech-language pathologist that has been shown to increase verbal communication in some children. Children with autism who become high-functioning like Haley typically show great improvement within the first few years of therapy, said Dr. Bob Sears, pediatrician and author of "The Autism Book." By 7 or 8, they will have overcome many of their challenges. Early intervention is critical; treatment should start as soon as possible, he said. Perhaps the greatest challenge for people with high-functioning autism is understanding the nuances of social interaction, Sears said. Haley relates to this. "Sarcasm sometimes really confuses me," Haley said. "The jokes that these kids make don't make any sense." Haley speaks fluidly and articulately. She is well-versed in public speaking, but she still has problems starting conversations. It's easier if people start talking to her first, she said. 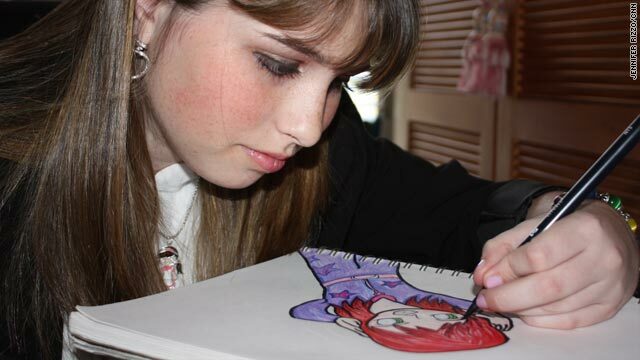 She has a passion for art and enjoys playing video games, but these are not common interests of girls at her school. "I don't know what to say to some of my typical peers, because I can't easily launch into discussion about makeup and, like, their boyfriends as easily as they probably could talk about something else with me," she said. But Haley also believes her autism also helps her in school. She can memorize things faster than most of her classmates, so it doesn't take as much work to study for tests. And her friends rely on her to give advice about social situations that's different from what most people would say, she said. Being a parent of a child with autism was isolating for Haley's mother, Sherry Moss. She remembers bringing it up with other parents when Haley received her diagnosis. They thought it was contagious. "They didn't want their kids to play with Haley anymore," she said. "So then, I never told anyone any more." The family has always informed school administrators about Haley's autism. But they kept the matter private otherwise until Haley developed a following for her artwork as her paintings were displayed at various galleries in South Florida last year. In middle school, everyone just cares that you're like them, and if you're different, you get picked on. "Once she started getting well-known, I was like, 'Now's the time Haley, now you have to be the face of autism and let people know what we went through, and give them hope,'" Haley's mother said. Haley went public in school when her teacher encouraged her to talk about autism in relation to her first art show. She also spoke at an Autism Society of America event last year. 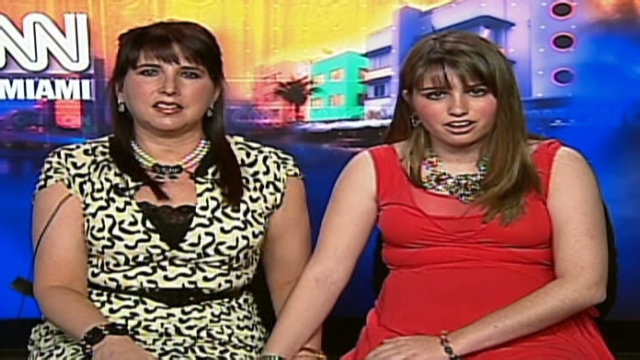 With Haley now open about her autism, the whole family feels relieved, her mother said. Haley also thinks that being "out" in school is easier. "It helped other people understand why I'm shy. It didn't help socially at all, but it helped those who were somewhat social with me understand why I am the way I am," she said. Much of Haley's advice in the book applies across the board for anyone in middle school, but she includes anecdotes written from other kids with autism spectrum disorders as well as teacher perspectives. She also tells about her personal experiences from the three schools she attended for sixth, seventh and eighth grade. People with autism spectrum disorders are often detail-oriented and miss the bigger picture, Haley said. Her mother would read English books with her and discuss the themes to help Haley see them more clearly. Haley recommends consulting parents, siblings, teachers and textbooks if you are stuck on something. Haley's approach to popular culture is methodical and detached: learn about the trends to fit in, even if you don't like them. She saw all the "Twilight" movies on opening night even though she doesn't like the franchise much. She can recognize a popular Jonas Brothers song. Being up on the fads helps with socializing and avoiding ridicule, she said. "In middle school, everyone just cares that you're like them, and if you're different, you get picked on," Haley said. "No one accepts different people." People with autism spectrum disorders tend to assume that everyone is trustworthy, and that can make them be easily manipulated, Haley writes. She recommends having a good relationship with your parents and entrusting them with your secrets instead of someone at school. Her parents help her with academic and social problems. Also, she looks to her mother to interpret classmates' comments that she didn't understand, instead of jumping to conclusions. Her next big project will either be a book about high school or an autism picture book, she said. Visit her Web site.